Zachary Taylor Assassination that changed the World. The First American Hero Killed by the NWO! Perhaps the title is misleading Zachary Taylor was not the first, nor the last good man who opposed a privately owned central bank. While I am proud to be a descendant of a true American Hero, I am sad to see other descendants of such a good man to so blatantly cover up such a man's death. The history books will not show you what happened to this man, actually ask yourself how much do you know about our 12th president? Men who fight the NWO (new world order) tend to be left out of the history books. I am disappointed all in all with the total lack of interest in the man who gave his life to protect the freedom of the people who deliberately seek to undermine his sacrifice. A brief history of the Taylor shows he was born on September 24th, 1784 in Virginia but later on in his life Taylor adopted the state of Kentucky. It is interesting to note that when looking at the white house website the official day of his death is left out. I am not sure why this is considering the fact that the day of his death, July 9th should be recognized as a National Holiday. Taylor was a national war hero. Taylor fought in the War of 1812 this war would not be the end of British bloodline tyranny as Taylor found out on July 9th, 1784. Armed Dignity in the 21st Century! 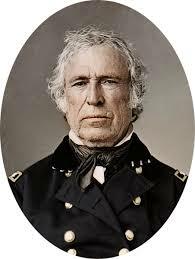 For the men like Zachary Taylor who fought to expand this great nation, we must not fail them. Where is the dignity in the armed forces today? Why do the marines feel that veterans are threats to America? Zachary Taylor was a veteran! A president and a good man. When we allow evil men to target our best men and they succeed... Well I am afraid that it is then that we realize that we have already lost! The war history of President Taylor is extensive and heroic. Most people do not realize that the British were financially supporting Native American uprisings throughout the continental United States prior to the War of 1812. The British were no friend to the Native Americans because they forced Native Americans into situations that had no benefit to anyone but the British Monarch. Had the British not so maniacally deceived the Native Americans perhaps there could have been peace between the white man and the Native American we will never know. Taylor would serve at Fort Harrison in modern day Indiana during the War of 1812. Taylor would play a key role in repelling the attack on Fort Harrison. 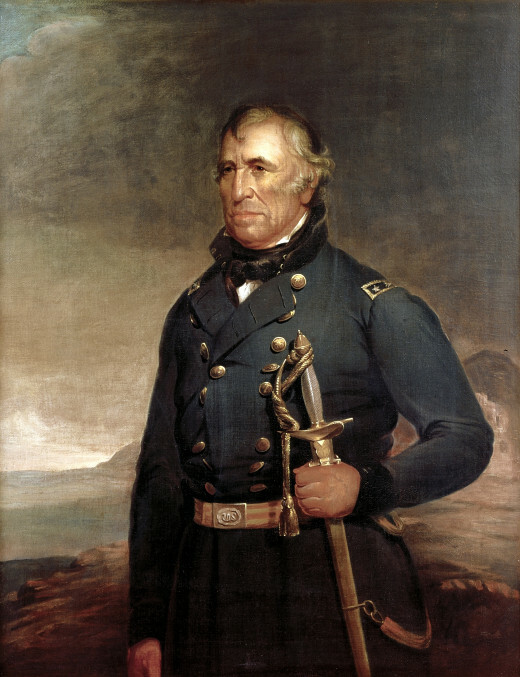 Zachary Taylor was a very keen commander and it showed during the Mexican-American War. During the Mexican-American War, Taylor was a Brigadier General who won a decisive victory over General Mariano Arista. The battle of Palo Alto was won by Taylor an impressive feat considering he was cut off by Mariano on his was to Fort Texas. The south owes much to Taylor because of his audacity in the face of difficulty. To show the true nature of Gen. Zachary Taylor, history shows us that Gen. Taylor and President Polk got into quarrels over a two-month truce Taylor promised the Mexican Army in exchange for the city of Monterrey. This enraged Polk who took Gen. Taylor's men and sent them into central Mexico to invade. Going beyond what Gen. Taylor understood as the goal of his campaign. The facts are Taylor was a Major General responsible for many battles that helped us establish the borders of our country. Ironically these issues seem to be coming round again as we hear of the Mexican Cartels funded by this rogue group using the CIA. Major General Taylor would have thought these actions treason and acted accordingly. I ask where are the men of this caliber today? Taylor would ultimately give his life to stop this rogue group from taking America back. You Must Read This! The Real History Behind America and Zachary Taylor! President Taylor was in the "Whig" party and only served 16 months as president before he was assassinated. Taylor was unique in many ways as a president because he held no political office prior to his presidency. What this means is he was never a politician he was only a soldier. Taylor is famously noted as never having voted not even for himself in an election. When it comes to key issues Taylor was not popular. When it came to slavery Taylor was opposed to it feeling it was socially and politically wrong, however, he owned slaves. What many people do not know is that the day after President Taylor threatened to hang those taking part in a rebellion against him President Taylor was dead. What was the rebellion about? The rebellion was against the confederacy and had a lot to do with slavery and the founding of a Centralized National Bank in America. Crisis hit an all time high during Taylor's presidency as major issues such as the expansion of slavery sought to undermine his presidency. President Taylor also felt that the position of president was silly and vowed he would not exercise his veto power. This may make you wonder what in the world is going on today. We can see how President Taylor felt about the position of president. He only vowed to use his veto power over the issue of the Compromise of 1850. President Taylor felt California should be considered a free state. He felt any other views were ridiculous and vowed he would veto any act of congress to create an unnecessary issue. A major issue was the fact that the south had a stranglehold on most of the continental US. The southern extremists wanted to succeed if they did not get their way and this went against what America wanted to achieve. Both Taylor and General George Washington believed that to create a position such as president would set a bad precedent for the future. They both realized the potential for abuse of such a position, both felt congress was the only body that should have power to legislate. This entire executive order deal we see now is against the constitution and I am sure the founding fathers are rolling in their memorials right now. We have been gotten by elite rulers we do not see. We should not even act as we do when electing an American president. This is what the elite have done to us here in America! They have got us fighting about such petty things like electing a president instead of electing state officials who keep the balance of power in check. The president is a puppet position and it should be our state and local elections that matter. Men have been warning us for a long time about the danger of having a position that can be turned into a dictatorship and now we see exactly why they were concerned. Many who have attempted to stop the NWO have “mysteriously” died. The Mysterious Death of President Taylor! We see that in 1991 President Taylor's body was actually exhumed to find out whether or not he was assassinated. So here are the facts. President Major General Taylor was a hardened war hero who fought in Mexico for years his nickname being "Old Rough and Ready" we are to believe that it was the July Sun that killed him. Note that the owners of the newspapers at that time were held by these same powers that even to this day own our national media. So writing a story about how a strong war hero died from the July sun is utter insanity to say the least. I honestly wonder what the citizens of America who loved this man thought about the news? Did they believe such a blatant lie? I doubt it personally. If being exposed to July sun and eating cucumbers and cherries kills us then perhaps we should all go to war as Major General Zachary Taylor did as war in the Mexican sun is less dangerous than July sun and Cherries in America. The conspiracy was born in 1991 as the "official" report claimed there was no arsenic in the bones and nails of President Taylor. The "mainstream" media quickly jumped on the boat before the boat had even been let out of the dock. Keep in mind President Taylor did not even declare his nomination he was the only one who has ever accomplished such a feat the people literally put him in office. So to kill this man is a high act of treason against the citizens of America. President Taylor won no friends when he opposed the "compromise of 1850" and this would be the final nail in his coffin. Why did President Taylor threaten to veto such a compromise? Slavery was a very important topic as the Compromise of 1850 made the issue of slavery a non-state choice for the territories of California and New Mexico. Basically, President Taylor was adamant that State rights rule over the power of the Federal Government. 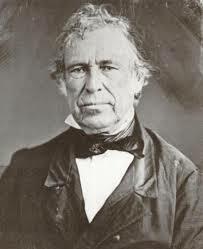 President Zachary Taylor believed that the states should have their own constitutions and that the federal government leave states alone to work for themselves. He did not believe that the federal government should meddle in the affairs of states. A lesson that would radiate into the future of this powerful country, a lesson we should have learned well, but I feel we are now repeating. Perhaps a new civil war is at hand we can only pray that is not the case. The Assassination Of President Taylor! 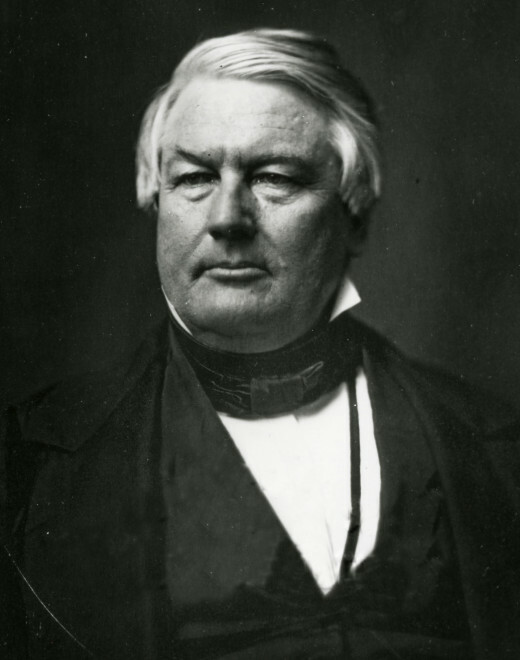 Within days of President Taylor's death, we see President Millard Fillmore immediately support the compromise of 1850 making it law shortly after Taylor's death. If ever there has been a case of a president being assassinated to fulfill an agenda this is that case. Even to this day the mainstream scientist will tell you there was no arsenic in Taylor's body. We know this is a lie now as the true facts have come to light. The facts are is that proponents of the NWO have slowly been disassembling America and today we see the fulfillment of their order. President Taylor said NO to a Central Bank, President Taylor said NO to slavery expansion and believed it should be outlawed altogether. I truly believe that Great Britain found a weakness in America. I believe this weakness was the South. I believe that the South has merged with the interest of the Royal Elite and now seek to destroy us from within, and this started after the War of 1812. I also believe they have succeeded and if we do not act soon we will fall and the history books will show nothing of who we are and what we stood for. I believe we will be written out of history entirely. We do have hope in this story, yes we have hope! We have hope because not too long after the death of Taylor another man named Abraham Lincoln was elected the president of the United States and this man would outlaw slavery altogether. Unfortunately, we see that with that win the federal government would cement in stone the power of the Fed over the power of state rights. State rights are at the forefront of discussion even today, and if we look at our past we will see that it is detrimental for us all to limit the power of the Federal government and eliminate the corrupt central bank as soon as possible, if not we will continue to fund the assassination of good men. Traitor Fillmore The Man Who Bows Down To Tyranny! Some say Lincoln did not care about blacks interest as it relates to slavery, that he only cared for the union. His speeches don't seem to support that though. Lincoln, would do anything to cement the union and deny any state from seceding from the union this is true. If there was a doubt by Lincoln it was this. I am sure President Lincoln understood that abolishing slavery would destroy the union, on the other hand, slavery is wrong see the dilemma. It would destroy the union just as we see today it has destroyed America. Slavery went underground cheap labor called "Free trade zones" dismantled America the businesses are all leaving. Where we had slavery in the light, now slavery is in the dark its all bad. It seems anything we do to make the world a better place ends in partial collapse and failure. Lincoln understood that slavery is what drove the economy in those days and people were making money. Lincoln understood that when you make slavery illegal it will just go underground and eventually maybe even 100 years or more in the future but it will come back into the light. Why is this? Well, just as I stated above look at America now where is the cotton industry? Where is the South tobacco industry? The former slave holders in the government were and still are mad at Lincoln. They went to the Brittish who always wanted America back anyway and made a deal, let's wake up America the South did secede. America is gone they brought in the Fed Bank and that ended America. "Let me print and control your nations money, and I care not who makes its laws!" Yes, America is gone! The south did not lose the war, look at it like this, the South and the North won the war, this means Great Brittain won the war. Just like any situation America broke away from these evil bloodlines and they waited for America to turn on itself and the civil war happened and just like any situation Brittain snuck right in to take us down from within. Slavery is wrong if people could just be Christian and do good works and be fair this world would be great. They do not do this, however, instead if you outlaw slavery in America the rich move from America or go underground to continue their wicked greedy ways. Honestly, this greed makes me sick, the money was there they just had to share and no can't do that man thinks he's God. God over his fellow man, as they say "I'm God and if you got a problem with it I will kill you" that is actually what a physicist just told a reporter when asked about CERN. Men are insane and I think Lincoln understood that these powers had to be placed in check before they tried taking over state by state until they owned the entire U.S. So Lincoln prevented that from happening for a little while, but here we are today. They want their slaves back and color has not a thing to do with it. Was President Zachary Taylor Assassinated? Was President Taylor Purposely Killed by the NWO? 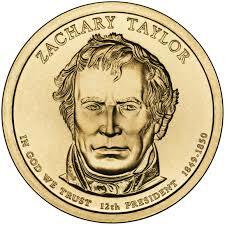 Good online resource on 12th president Zachary Taylor! Agree with your views on the TPP, and the fact that Democrats and Republicans both support it lends credence to the conspiracy arguments. Thanks for the comment. I think he was assassinated because his comment right before his death. The NWO was really working hard back then to infiltrate the country and get in their World Bank aka the FED and the IRS into place. These men knew better that's why it took so many years and sooo much money to politicians via lobbyist to steal back their country. It is ironic we now hear about Jade Helm and the BLM trying to take back that same land Taylor fought so hard to acquire and distribute fairly. Now they are pushing through the TPP and this pretty much destroys America as we know it. Right in the very land Zachary Taylor fought so hard to preserve. Looks like there could be an American Civil War at hand. I just hope the sides are clear and people wake up as to what is going on. The ironic thing is that Zachary Taylor's son Richard Taylor was a pretty fair general himself, fighting for the South in the Civil War. There is no doubt that Taylor had powerful political forces arrayed against him, most notably President Polk, but I would have to do a little more investigation before I support the assassination theory. Great hub!